Science says some moderate drinking may be good for you—but science doesn’t say that means you should go out and throw back a bucket of beers this weekend. Navigating a cocktail menu can be tricky, and most of the time it’s hard to decipher exactly what’s in your drink and whether or not it’s actually good for you. But this cocktail recipe—which you can most definitely DIY—is packed with good-for-you ingredients. 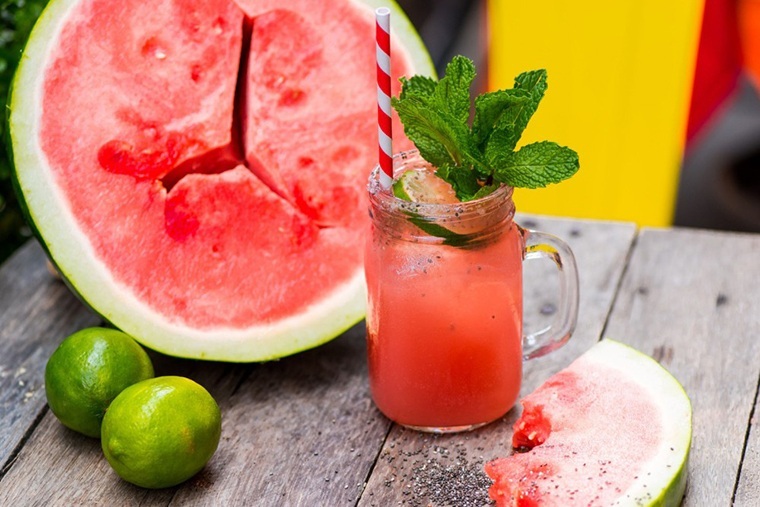 Scroll down for Latin Beet Kitchen’s watermelon and chia cocktail recipe. Mix two parts kosher salt and one part chia seeds in a small bowl. Take your cocktail glass and wet the rim with a lime wedge before dipping into the salt and chia seed mixture. 1. Start by making your drunken chia seeds. Mix 1/2 oz. of chia seeds with 3 oz. of water and 1.5 oz. of vodka, then set aside. 2. Use a blender to smooth and liquify a cup of watermelon. 3. In a shaker glass combine ice, 2 oz. of vodka, lime juice, and the watermelon puree. Then shake vigorously. 4. Fill a glass with ice and strain the mixture into the glass. 5. Add and stir drunken chia seeds into the cocktail and top with ginger beer. Heading to the Hamptons this summer? Here’s a guide to eating and drinking healthy out east. And if you’re staying in, whip up this sugar-free rosé cocktail.